The song may have been written for a former lover, but the words ring true as a plea to a middle class that does not understand what its devotion to upward mobility has cost those on the lower rungs of the class structure. Even feminists, who might have found much to criticize in Dylan’s embrace of a lingerie brand long derided for its objectification of women, remained surprisingly mute. Of course, feminists have never been much invested in the work of Dylan. They had no faith to lose, and perhaps he knew it. 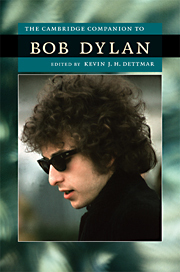 Yet when one considers the biography of Dylan, one might argue that his late career embrace of the market, like the other two publicly “transitional” moments in the singer’s life – “going electric” at the Newport Folk Festival in 1965, and converting to Christianity in 1978 – were interdependent, and even inevitable. The recurring theme is conversion: his rejection of the folk movement at Newport a transition in musical style most often perceived as an ideological rift, and his embrace of Evangelical Christianity a revolution in personal consciousness. Both, of course, were nods to the zeitgeist.